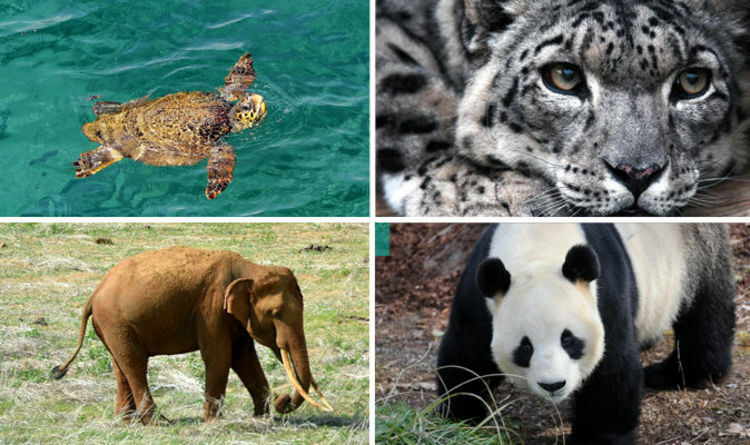 A new report has found turtles, elephants, tigers, snow leopards, giant pandas and polar bears could all find themselves in a battle for survival. The scientific study said current carbon emission levels would see a 4.5C rise in the temperature by 2100 and that even if drastic measures were taken to cut that temperature rise to just 2C a quarter of all species could be lost. Climate change has been blamed for the potential loss of wildlife. Professor Rachel Warren, from the University of East Anglia, said: “We studied 80,000 species of plants, mammals, birds, reptiles and amphibians and found that 50 per cent of species could be lost from these areas without climate policy. In the Mediterranean, as much as 30 per cent of species could be at risk, while 36 per cent of plants would be eradicated. The temperature rise would leave many turtles at risk of dying out as the warm weather could cause eggs to fail to hatch. Meanwhile, species such as giant pandas, snow leopards and polar bears will see their natural habitat and food supplies massively cut. The Amazon, south-west Australia and the Miombo Woodlands in southern Africa are set to be the areas most affected. Commenting on the report, Dr Stephen Cornelius, from WWF UK, said: “This is a global problem, it shows that across 35 priority places scattered all over the world, all of them over the last 50 years, across all the seasons, have seen temperatures rise. “We can already observe changes and impacts, and projections show they will continue. He also warned that the loss of some plants could have bigger consequences on the wider eco-system. Dr Cornelius said species such as certain birds may be lost if their food source was removed through the loss of a plant.